This is information about Open Source Software project Moebinv , see its Webpage1 for updates. The enclosed DVD (ISO image) with software is derived from several open-source projects, notably Debian GNU–Linux , GiNaC library of symbolic calculations , Asymptote  and many others. Thus, our work is distributed under the GNU General Public License (GPL) 3.0 . In this Appendix, we only briefly outline how to start using the enclosed DVD or ISO image. As soon as the DVD is running or the ISO image is mounted as a virtual file system, further help may be obtained on the computer screen. We also describe how to run most of the software on the disk on computers without a DVD drive at the end of Sections 1.1, 1.2.1 and 1.2.2. 1. Insert the DVD disk into the drive of your computer. 2. Mount the disk, if required by your OS. 3. Open the contents of the DVD in a file browser. 4. Open the file index.html from the top-level folder of the DVD in a web browser, which may be done simply by clicking on its icon. 5. Click in the browser on the link View book illustrations. If your computer does not have a DVD drive (e.g. is a netbook), but you can gain brief access to a computer with a drive, then you can copy the top-level folder doc from the enclosed DVD to a portable medium, say a memory stick. Illustrations (and other documentation) can be accessed by opening the index.html file from this folder. In a similar way, the reader can access ISO images of bootable disks, software sources and other supplementary information described below. A. To boot your computer from the DVD itself. B. To run it in a Linux emulator. C. Advanced: recompile it from the enclosed sources for your platform. Method A is straightforward and can bring some performance enhancement. However, it requires hardware compatibility; in particular, you must have the so-called amd64 (or i386 for previous versions up to v3.0) architecture. Method B will run on a much wider set of hardware and you can use CAS from the comfort of your standard desktop. However, this may require an additional third-party programme to be installed. WARNING: it is a general principle, that running a software within an emulator is more secure than to boot your computer in another OS. Thus we recommend using the method described in Section 1.2.2. 2. Switch off or reboot the computer. 3. Depending on your configuration, the computer may itself attempt to boot from the DVD instead of its hard drive. In this case you can proceed to step 5. 4. If booting from the DVD does not happen, then you need to reboot again and bring up the “boot menu”, which allows you to chose the boot device manually. This menu is usually prompted by a “magic key” pressed just after the computer is powered on—see your computer documentation. In the boot menu, chose the CD/DVD drive. 5. You will be presented with the screen shown on the left in Fig. 1.1. Simply press Enter to chose the “Live (486)” or “Live (686-pae)” (for more advanced processors) to boot. To run 686-pae kernel in an emulator, e.g. VirtualBox, you may need to allow “PAE option” in settings. 6. If the DVD booted well on your computer you will be presented with the GUI screen shown on the right in Fig. 1.1. Congratulations, you can proceed to Section 1.3. If the DVD boots but the graphic X server did not start for any reason and you have the text command prompt only, you can still use most of the CAS. This is described in the last paragraph of Section 1.3. Figure 1.1: Initial screens of software start up. First, DVD boot menu; second, IDE screen after the booting. If your computer does not have a DVD drive you may still boot the CAS on your computer from a spare USB stick of at least 1Gb capacity. For this, use UNetbootin  or a similar tool to put an ISO image of a boot disk on the memory stick. The ISO image(s) is located at the top-level folder iso-images of the DVD and the file README in this folder describes them. You can access this folder as described in Section 1.1. You can also use the enclosed CAS on a wide range of hardware running various operating systems, e.g. Linux, Windows, Mac OS, etc. To this end you need to install a so-called virtual machine, which can emulate amd64 architecture. 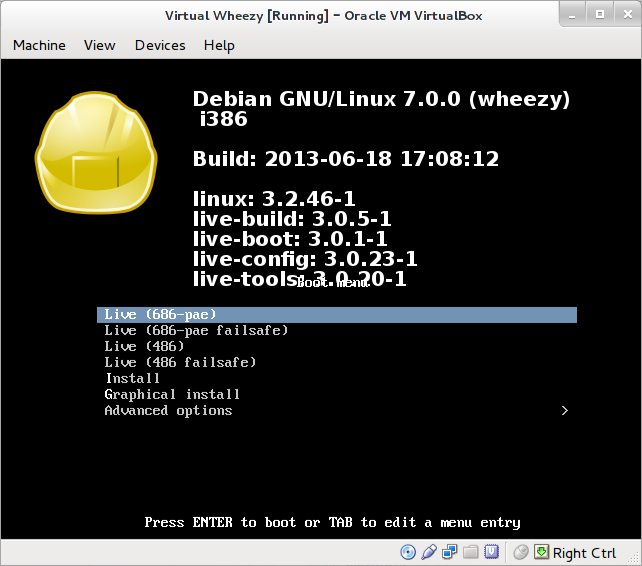 I would recommend VirtualBox —a free, open-source program which works well on many existing platforms. There are many alternatives (including open-source), for example: Qemu , Open Virtual Machine  and some others. 1. Insert the DVD disk in your computer. 2. Open the index.html file from the top directory of the DVD disk and follow the link “Installing VirtualBox”. This is a detailed guide with all screenshots. Below we list only the principal steps from this guide. 3. Go to the web site of VirtualBox  and proceed to the download page for your platform. 4. Install VirtualBox on your computer and launch it. 5. Create a new virtual machine. Use either the entire DVD or the enclosed ISO images for the virtual DVD drive. If you are using the ISO images, you may wish to copy them first to your hard drive for better performance and silence. See the file README in the top-level folder iso-images for a description of the image(s). 6. Since a computer emulation is rather resource-demanding, it is better to close all other applications on slower computers (e.g. with a RAM less than 1Gb). 7. Start the newly-created machine. You will need to proceed through steps 5–6 from the previous subsections, as if the DVD is booting on your real computer. As soon as the machine presents the GUI, shown on the right in Fig. 1.1, you are ready to use the software. If you succeeded in this you may proceed to Section 1.3. Some tips to improve your experience with emulations are described in the detailed electronic manual. The core of our software is a C++ library which is based on GiNaC —see its web page for up-to-date information. The latter can be compiled and installed on both Linux and Windows. Subsequently, our library can also be compiled on these computers from the provided sources. Then, the library can be used in your C++ programmes. See the top-level folder src on the DVD and the documentation therein. Also, the library source code (files cycle.h and cycle.cpp) is produced in the current directory if you pass the TEX file of the paper  through LATEX. Our interactive tool is based on pyGiNaC —a Python binding for GiNaC. This may work on many flavours of Linux as well. Please note that, in order to use pyGiNaC with the recent GiNaC, you need to apply my patches to the official version. The DVD contains the whole pyGiNaC source tree which is already patched and is ready to use. There is also a possibility to use our library interactively with swiGiNaC , which is another Python binding for GiNaC and is included in many Linux distributions. The complete sources for binding our library to swiGiNaC are in the corresponding folder of the enclosed DVD. However, swiGiNaC does not implement full functionality of our library. Once you have booted to the GUI with the open CAS window as described in Subsections 1.2.1 or 1.2.2, a window with Pyzo (an integrated development environment—IDE)) shall start. The left frame is an editor for your code, some exercises from the book will appear there. Top right frame is a IPython shell, where your code will be executed. Bottom left frame presents the files tree. The presentation below will be given in terms of IPython shell, an interactions with Pyzo is even more intuitive. The keyboard will be switched and the corresponding national flag displayed at the bottom-left corner of the window. For another keyboard you need to use the international two-letter country code instead of pt in the above command. The first exclamation mark tells that the interpreter needs to pass this command to the shell. Here, si stands for σ—the signature of the point space metric. Thus, the answer reads km−l2+σ n2—the determinant of the FSCc matrix of C. Note, that terms of the expression can appear in a different order: GiNaC does not have a predefined sorting preference in output. Thus, our statement is proven. For any other CAS-assisted statement or exercise you can also visit the corresponding solution using its number next to the symbol in the margin. For example, for Exercise 6.22, open file ex.6.22.py. However, the next mouse sign marks the item 6.24.i, thus you need to visit file ex.6.24.i.py in this case. These files are located on a read-only file system, so to modify them you need to save them first with a new name (Ctrl-X Ctrl-W), exit the editor, and then use %ed special to edit the freshly-saved file. By now, a separate window will have opened with cycle Cn drawn triply as a circle, parabola and hyperbola. The image is also saved in the Encapsulated Postscript (EPS) file cycles.eps in the current directory. Note that you do not need to retype inputs 12 and 13 from scratch. Up/down arrows scroll the input history, so you can simply edit the value of sign in the input line 11. Also, since you are in Linux, the Tab key will do a completion for you whenever possible. The interactive shell evaluates and remember all expressions, so it may sometime be useful to restart it. It can be closed by Ctrl-D and started from the Main Menu (the bottom-left corner of the screen) using Accessories → CAS pycyle. In the same menu folder, there are two items which open documentation about the library in PDF and HTML formats. Note, two cycles B-(0) and B-(1) were automatially created as "invisible" parents of cycle (point) B. This creates an encapsulated PostScript file figure-example.eps, which is shown on Fig. 1.3. See  for further documentation of figure library. Examples include symbolic calculations and automatic theorem proving. Figure 1.3: Example of figure library usage. Exercises will be performed one by one with their numbers reported. Numerous graphical windows will be opened to show pencils of cycles. These windows can be closed by pressing the q key for each of them. This batch file suppresses all output from the exercises, except those containing the False string. Under normal circumstances, these are only Exercises 7.14.i and 7.14.ii. The full capacity of the CAS is also accessible from the command prompt, except for the preview of drawn cycles in a graphical window. However, EPS files can still be created with Asymptote—see shipout() method. Our C++ library defines the class cycle to manipulate cycles of arbitrary dimension in a symbolic manner. The derived class cycle2D is tailored to manipulate two-dimensional cycles. For the purpose of the book, we briefly list here some methods for cycle2D in the pyGiNaC binding form only. In both cases, we use a metric defined by a Clifford unit e.
Cycles can be added (+), subtracted (-) or multiplied by a scalar (method exmul()). A simplification is done by normal() and substitution by subs(). Coefficients of cycles can be normalised by the methods normalize() (k-normalisation), normalize_det() and normalize_norm(). For a given cycle, we can make the following evaluations: hdet()—determinant of its (hypercomplex) FSCc matrix, radius_sq()—square of the radius, val()—value of a cycle at a point, which is the power of the point to the cycle. There are the following methods for building cycle similarities: sl2_similarity(), matrix_similarity() and cycle_similarity() with an element of SL2(ℝ), a matrix or another cycle, respectively. There are several checks for cycles, which return GiNaC relations. The latter may be converted to Boolean values if no variables are presented within them. The checks for a single cycle are: is_linear(), is_normalized() and passing(), the latter requires a parameter (point). For two cycles, they are is_orthogonal() and is_f_orthogonal(). 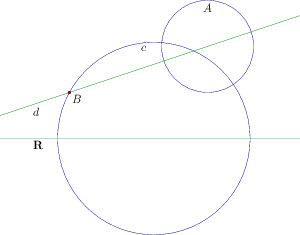 where C2 will be a generic cycle passing the point [u,v] and orthogonal to C1. See the proof of Theorem 4.13 for an application. There are the following methods specific to two dimensions: focus(), focal_length()—evaluation of a cycle’s focus and focal length and roots()—finding intersection points with a vertical or horizontal line. For a generic line, use method line_intersect() instead. For visualisation through Asymptote, you can use various methods: asy_draw(), asy_path() and asy_string(). They allow you to define the bounding box, colour and style of the cycle’s drawing. See the examples or full documentation for details of usage. Further information can be obtained from electronic documentation on the enclosed DVD, an inspection of the test file CAS/pycycle/test_pycycle.py and solutions of the exercises. a, b, c, d: elements of SL2(ℝ) matrix. u, v, u1, v1, u2, v2: coordinates of points. k, l, n, m, k1, l1, n1, m1: components of cycles. sign, sign1, sign2, sign3, sign4: signatures of various metrics. s, s1, s2, s3: s parameters of FSCc matrices. x, y, t: spare to use. mu, nu, rho, tau: two-dimensional (in vector formalism) or one-dimensional indexes for Clifford units. M, M1, M2, M3: diagonal 2× 2 matrices with entries −1 and i-th sign on their diagonal. sign_mat, sign_mat1, sign_mat2: similar matrices with i-th s instead of sign. e, es, er, et: Clifford units with metrics derived from matrices M, M1, M2, M3, respectively. The solutions of the exercises make heavy use of these objects. Their exact definition can be found in the file CAS/pycycle/init_cycle.py from the home directory. Arpad and Geza Kovacs. UNetbootin—Create Bootable Live USB Drives for Linux, 2011. URL: http://unetbootin.sourceforge.net/. Christian Bauer, Alexander Frink, Richard Kreckel, and Jens Vollinga. GiNaC is Not a CAS, 2001–. URL: http://www.ginac.de/. Fabrice Bellard. QEMU—a Generic and Open Source Machine Emulator and Virtualizer, 2011. URL: http://qemu.org/. Jonathan Brandmeyer. 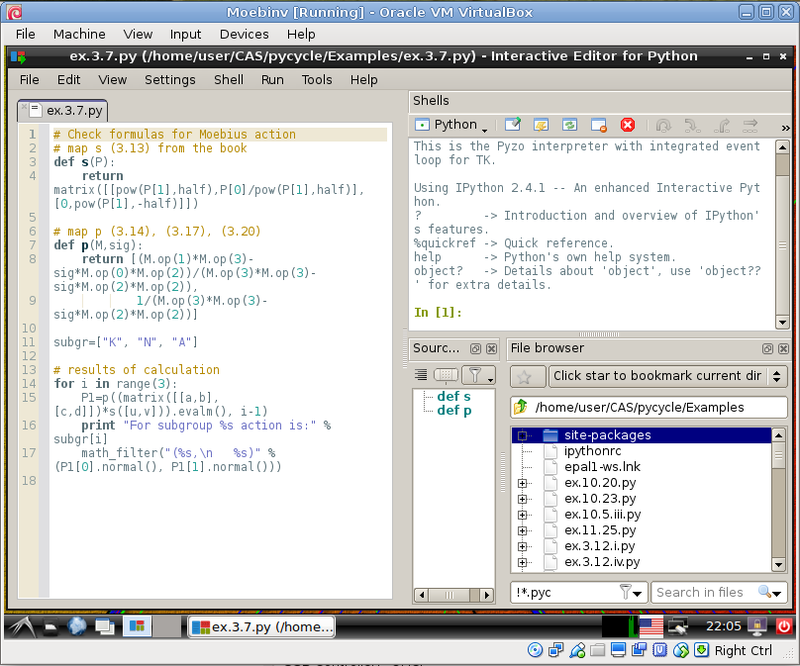 PyGiNaC—a Python interface to the C++ symbolic math library GiNaC, 2004–2007. URL: http://sourceforge.net/projects/pyginac/. GNU. General Public License (GPL). Free Software Foundation, Inc., Boston, USA, version 3 edition, 2007. URL: http://www.gnu.org/licenses/gpl.html. Andy Hammerlindl, John Bowman, and Tom Prince. Asymptote—powerful descriptive vector graphics language for technical drawing, inspired by MetaPost, 2004–2011. URL: http://asymptote.sourceforge.net/. Vladimir V. Kisil. Schwerdtfeger–Fillmore-Springer-Cnops construction implemented in GiNaC. Adv. Appl. Clifford Algebr., 17(1):59–70, 2007. On-line. Updated full text, source files, and live ISO image: arXiv:cs.MS/0512073. Project page http://moebinv.sourceforge.net/. Zbl05134765. Vladimir V. Kisil. Ensembles of cycles programmed in GiNaC. 2014–2015. http://moebinv.sourceforge.net/. Oracle. VirtualBox—Powerful x86 and AMD64/Intel64 Virtualization Product, 2011. 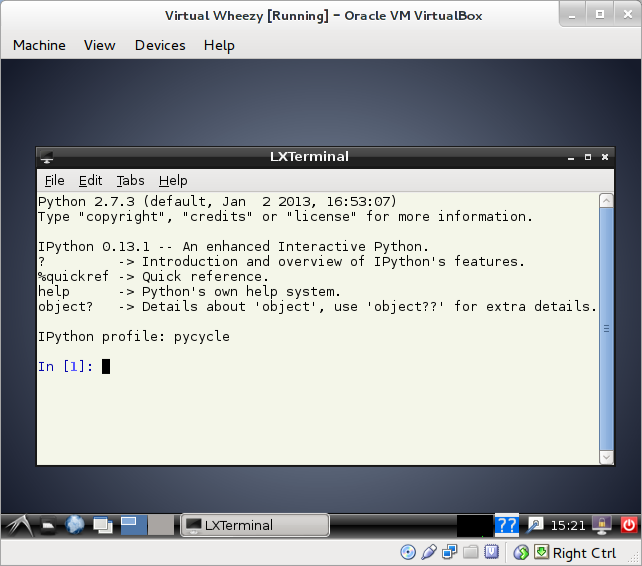 URL: http://www.virtualbox.org. OVMTP. Open Virtual Machine—the Open Source Implementation of VMware Tools, 2011. URL: http://open-vm-tools.sourceforge.net/. Fernando Pérez and Brian E. Granger. IPython: a system for interactive scientific computing. Computing in Science and Engineering, 9(3):21–29, May 2007. URL: http://ipython.org. Ola Skavhaug and Ondrej Certik. swiGiNaC—a Python Interface to GiNaC, Built with SWIG, 2010. URL: http://swiginac.berlios.de/. Software in the Public Interest, Inc. Debian—The Universal Operating System, 1997–2012. URL: http://www.debian.org/. visitors to this page since 20/10/2011. Last modified: April 10, 2018.